Why do all of my avocados ripen at the same time? How much guacamole can one person eat? 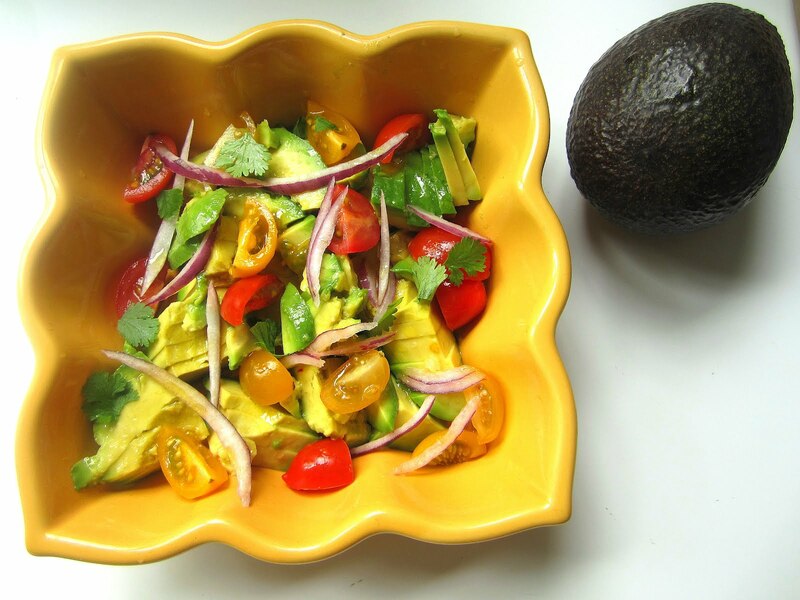 This salad stays fresh for a day or two, unlike guac, that turns brown after a few hours. I love this salad spooned over grilled fish or shrimp, or just on its own for lunch. It's the perfect summer salad and another great way to use my cherry tomatoes. Place the avocado slices in a bowl and sprinkle w/ kosher salt. 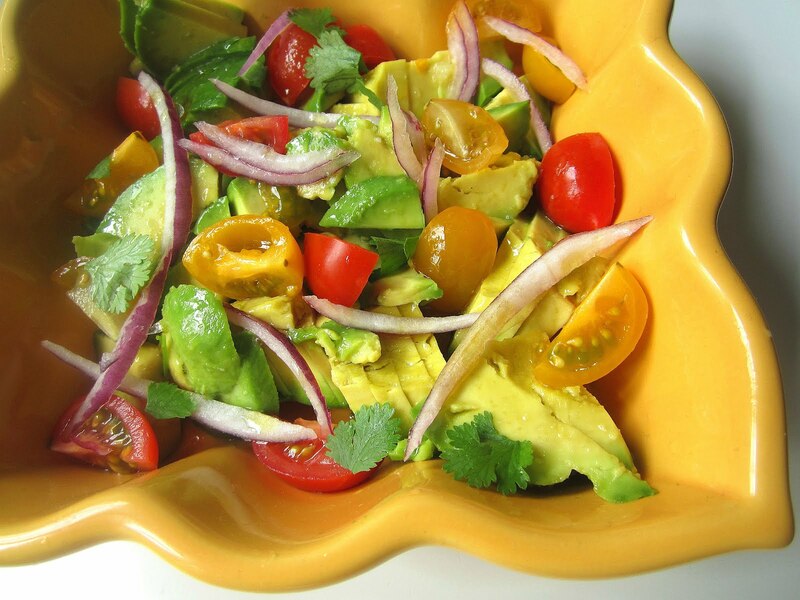 Lay the cherry tomatoes and onions on top of the avocado and squeeze the lemon juice on top. Drizzle with olive oil and garnish with the fresh cilantro. I covered the leftovers with plastic wrap overnight in the fridge, and the second day the salad was still bright and fresh. Avocado salad is a treat. I can't get enough of avocado...just wish they weren't so pricey. My daughter has two trees in her backyard. I am hoping that there is fruit in our future. You're right. It would be wonderful over fish. Stacey, if the avocados are on your own tree, they can stay on the tree, where they will not ripen. Pick them with a bit of stem and ripen until the stem falls off. My former housekeeper from Mexico taught me how to "keep" ripe avocados. As soon as they yield to light pressure, wrap in aluminum foil and press it lightly to the avocado. Refrigerate. We have them at very good prices right now - I buy 4 or 5 at a time and ripen and store them. They keep for 4-5 days. I have never lost one. If I only need half of a large avocago, I wrap the remaining half snugly in plastic wrap, then rewrap it in the piece of foil and return to the refrigerator. I use it the next day. There should be no air in this wrap process as air is the cut avocado's nemesis. When we lived on Point Loma (San Diego) we had a wonderful avocado tree. No longer live there. Sob. This is my kind of salad... and I think I would add it to just about everything! There's nothing like a fresh ripe, no brown spots avocado, love your salad!I will do the tinfoil tip from your reader! We adore avocados; our neighbor has a huge avocado tree that I've been eyeing ever since I got here; they're called wild avocados, the long elongated type, but still delicious. can't wait to see him back from his vacation to talk guacamole and salads like this one! One of my biggest pet peeves about avocado recipes is the inevitable browning. I'm so glad this dish avoids that!